In the cold of San Francisco summer Italian immigrants, along with fishermen, stevedores, shipbuilders and other maritime workers of all backgrounds would huddle in the damp fog of the mornings and evenings around cauldrons of hot fish stew. Cioppino is a soup that is 100% American but with a strong Italian accent. Writer and TV personality Michael Chiarello likes to quip that the word "cioppino" means nothing in Italian – fishermen on the San Francisco piers "chip in" whatever the catch of the day is. 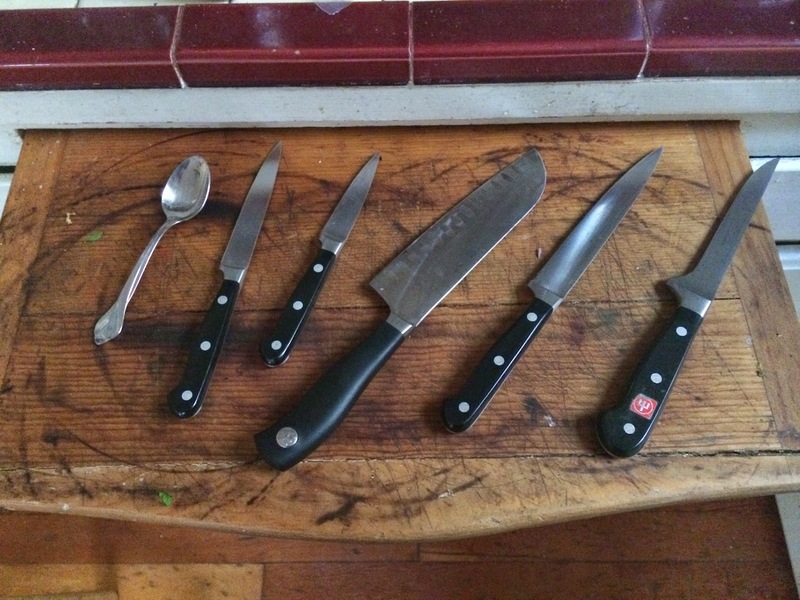 A cursory glance suggests the word may be derived from the Ligurian dialect for the word "to chop" (ciuppin). Similarly, the roots for the term "chowder" are murky as well. Most likely from the old French term chaudière (a stew pot or casserole) which also gives us caudron/cauldron. 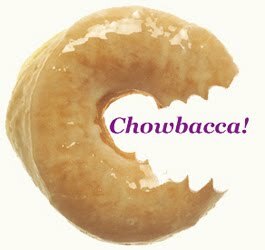 "Chow" (shortened from "chow-chow") on the other hand is a pidgeon-English bastardization for dialectic Chinese "cha-cha" or "tsa-tsa" for a stew or stir-fry of mixed ingredients. Jeff Smith, the frugal gourmet, often noted that he thought "melting pot" wasn't the best metaphor for America since each component would lose it's individual identity and become part of a homogenized mass. "Vive la différance," as they say. Smith's vision of America is similar to mine, then, that the integrity of individual components of a dish, as with this nation, are what is important to elevation out of the morass of homogeny. 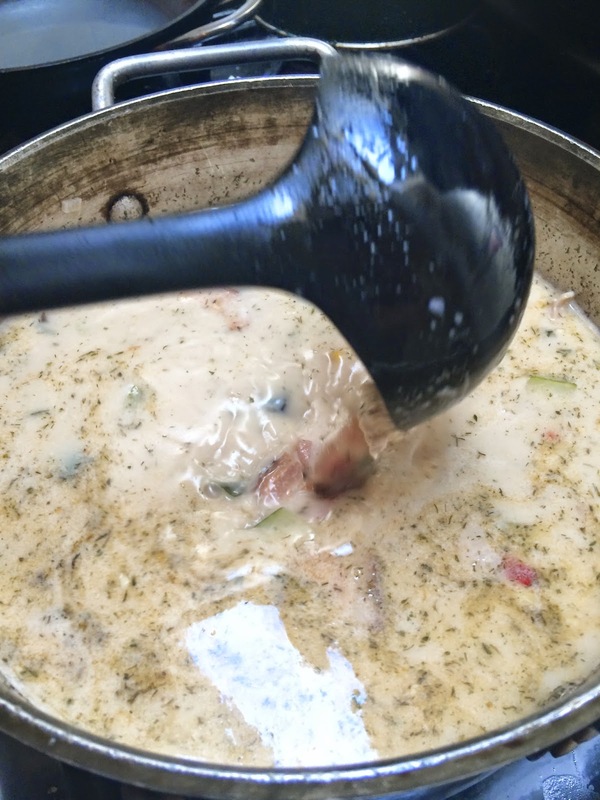 When a friend telephoned to tell me that she was going to be buying half a sack of oysters back from her restaurant (too old to serve on the half shell or even bake by safety guidelines but not yet dead or spoiled), I figured I would make a traditional New England chowder from the oysters, their liquor and whatever chunks of fish I might find appealing at the supermarket (we were going to be getting together long after any good fishmonger would have been open). Subsequent to the Tōhoku Earthquake on 11th March, 2011 and resulting tsunami that killed scores of people, three of six reactors at the Fukushima Daiichi Power Plant operated by Japanese power utility TEPCO melted down ultimately resulting in leaking radioactive material into the air, soil and groundwater in Fukushima and ultimately flushing contaminated water into the ocean – a detail that TEPCO allegedly tried to conceal initially. This is certainly no small matter, TEPCO reported high levels of caesium isotopes (cs-134, with a half life of about two years and cs-137, with a half-life of 30 years) in groundwater near the accident site. Obviously people have a right to be concerned about the dangers posed by this level of radioactivity (in some cases near or worse than Chernobyl). Fortunately the Pacific Ocean is large enough that the caesium isotopes released by Fukushima Daiichi are so dissolved as to be rendered ineffective, and oceanic currents are such that the brunt of the radiation (such that it is) is not expected to reach the coast of North America until the fall of 2014 (again in amounts so dilute as to be effectively indistinguishable from background radiation levels – and don't forget, we used to explode thermonuclear and other atomic weapons in the Pacific Ocean with great naïve abandon). There is no reason to worry about eating oysters from the west coast. So far we have not detected any cesium-134 concentrations along the beaches of the west coast. This isotope is a unique tracer of the Fukushima release because it has a short half life. There are other radionuclides in the ocean that remain from the days of nuclear weapons testing. There is no cesium-134 left from the 1960s, so if we detect this isotope it had to have come from Fukushima. We haven't detected any cs-134 and we have detected the typical background levels of cs-137. 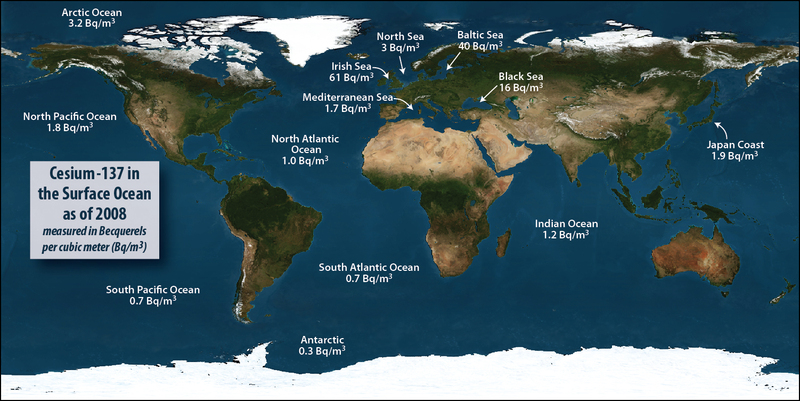 Cesium isotopes were the main isotopes released into the seawater that would travel across the ocean. Cesium is like a salt, so it does not accumulate in biological tissues. When it is ingested by fish it leaves the body again fairly rapidly. So, not only are west coast oysters not exposed to Fukushima radionuclides, they will not accumulate in the tissue anyway. There are other radionuclides that do accumulate in animals, like Strontium-90. We are interested in measuring this isotope too, but very little of this isotope was present in that initial release from Fukushima. When the plume of radionuclides does reach the west coast, we expect the levels to be very low. The radionuclide concentration decreased rapidly as the water moved away from Fukushima. 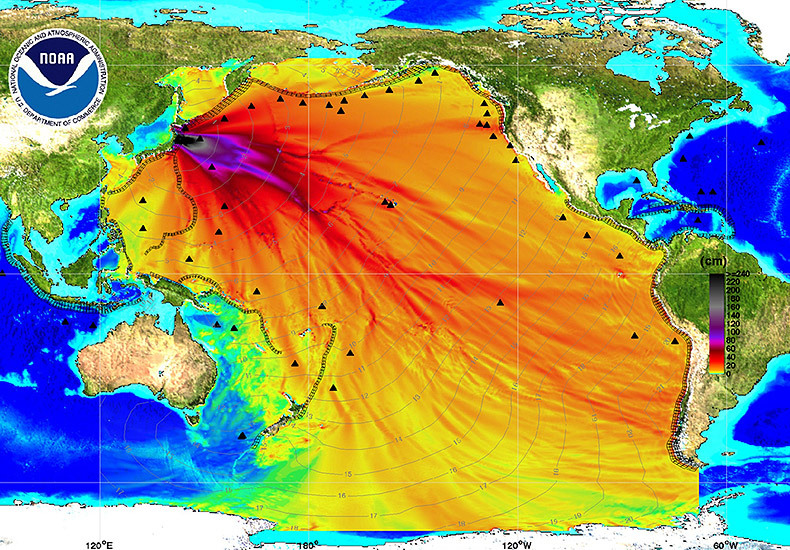 The radionuclides are diluted by mixing with seawater as they are transported by ocean currents across the Pacific. In the open ocean, we have measured Cs-137 levels elevated by about 3-5 [becquerels] per cubic meter of seawater due to Fukushima release (you can see that data at ourradioactiveocean.org/results). The background level of Cs-137 present in seawater because of nuclear weapons testing is between 1 to 2 [becquerels] per cubic meter of seawater. For comparison, the EPA limit of Cs-137 in drinking water is 7400 [becquerels] per cubic meter of water. So, the levels we have detected so far in the open ocean are very very low, and they will probably be even lower when it reaches the beaches. I hope this helps. There is no reason to be concerned about west coast seafood. I wouldn't eat seafood that was collected immediately next to the Fukushima plant, and they have closed those fisheries. My dinner companion picked me up at the local watering hole where we sped off for Safeway, a 1/3rd sized hotel pan full of oysters on ice in the back seat of her car. We got home and got to work, first opening a bottle of chablis – to make sure it wasn't poisoned (see discussion above regarding radiation). 3-4 dozen small Pacific oysters on the half shell. 3/4 cups of bread crumbs (we bought the pre-seasoned sort, but if you want to make your own simply toast bread in a 300ºF oven until dry and brown, pulse in a food processor and add dry of fresh herbs to your taste; herbes de Provence, rosemary, sage, thyme and parsley, etcetera). 1 tablespoon of brie or triple crême cheese, room temperature. 1/3 cup of finely chopped bacon. 1/3 cup of fresh Italian parsley, finely chopped. Mix wine, herbs, shallots, bacon, cheese and breadcrumbs until cohesive enough to spoon into "quenelles." Top oysters with mixture enough to mostly cover the oyster meat. Leave as loose as possible. Try to retain the oyster liquor so that it will be absorbed in the crumb mixture when baked. Bake oysters on top rack of the oven for about 10 minutes or until breadcrumb mixture is nicely browned. Serve with a nice white wine or Champagne. Or, Bulleit Rye as we did. 2 quarts of Shellfish Stock (see below). 3-4 dozen raw oysters taken out of their shells, with the liquor reserved. 1 lbs of cod, pollack or some other white fish cut into 3/4" cubes. 1 red bell pepper, 1/2" dice. 2 medium zucchini, 1/2" dice. 1 fresh chile (jalapeño, serrano, whatever suits your taste), diced. 1 1/2 lbs of new potatoes (fingerling, yellow, red, etcetera), parboiled and cut into 3/4" pieces. 1 1/3 cups of cooked bacon cut into 1/2" pieces. Corn kernels, raw, cut from two ears of sweet summer corn. 1/4 cup of chopped shallots. 1 tablespoon herbes de Provence, dry. 1/3 cup of rye whiskey. 1/4 cup of seasoned breadcrumbs. 1/2 stick (about 4 tablespoons) unsalted butter. Handful of roughly chopped Italian parsley. Simmer stock, bacon, dry herbs and vegetables (except for the corn, zucchini, garlic and shallots) for about 20 minutes until potatoes are tender. In a saucier, combine breadcrumbs, garlic, shallots and butter and heat over high heat until it thickens into a roux; reduce heat and add cream. 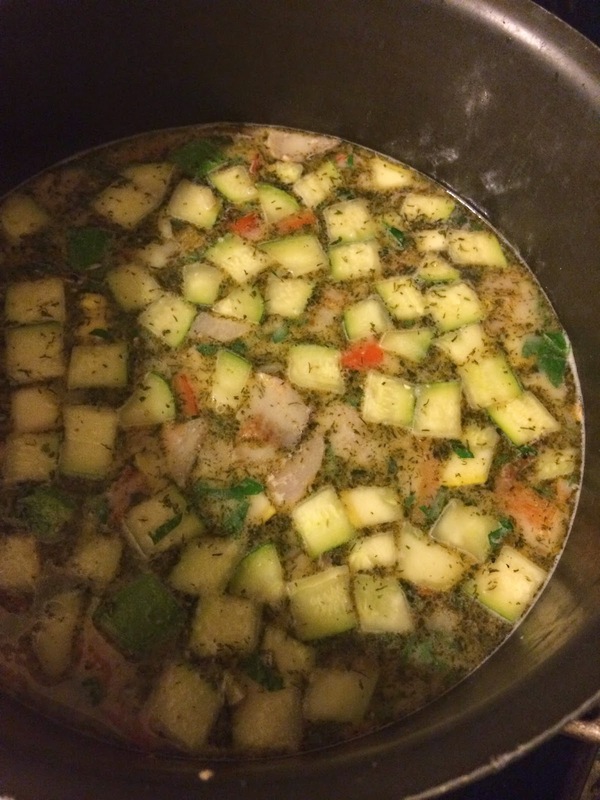 Mix until blended then temper with a few ladles of the stock and vegetables and transfer back into the soup pot. Lower heat. Add remaining vegetables and the whiskey, simmer for another 5 minutes. Add the oysters, oyster liquor, cod and parsley and remove from heat. Cover pot and allow residual heat to cook the meat. Serve hot with toasted sourdough bread or crackers and beer. 2 quarts of water or 1 1/2 quarts water plus 1/2 quart of meat stock (do not use canned). 2 cups of mirepoix (2:1:1 onions:celery:carrot). Corn "bones" (the cob of the corn after removing the kernels plus the husks, chopped). 2-3 cups of shrimp heads and shells. 6-10 oyster shells, preferably with the adductor muscles attached. Italian parsley stems and trimmings. 1 cup of good white wine. Add everything except the white wine. Simmer just below the boil for about 40 minutes, then strain. Boil rapidly for about 15 minutes, add wine and remove from heat. Chill immediately unless you are going to use it right away. 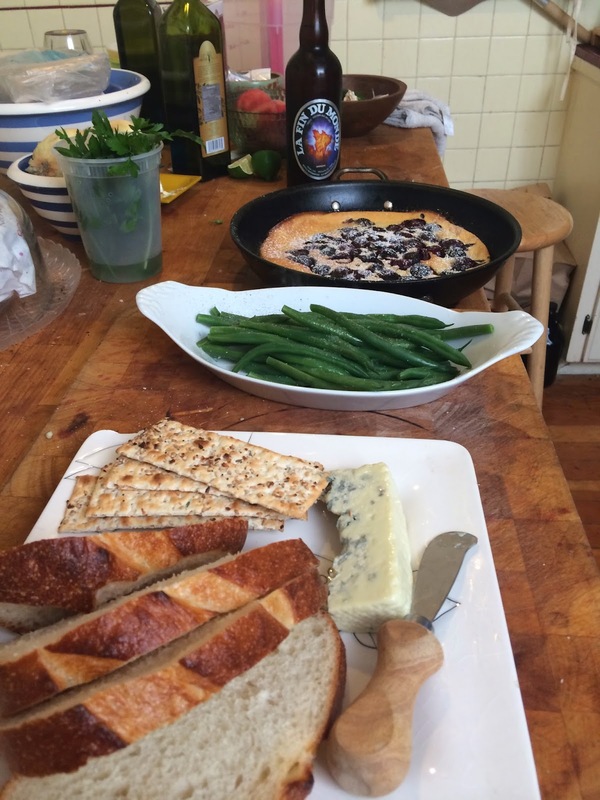 Nice cold summer day accoutrement for chowder: bread, cheese, haricot verts, clafouti, La Fin Du Monde.